I was hired this past July to become the managing editor for Shine: Living in God’s Light, the new curriculum available to all Anabaptist related churches (and beyond) that will follow the popular Gather ‘Round curriculum. Even though I have been a Sunday school teacher and superintendent at my church, working with Sunday school curriculum in this role has been an eye-opening experience. #5 – The process to produce one quarter of a curriculum begins many months before Sunday school teachers begin to teach it. The Fall 2014 quarter began in in earnest in 2012, and planning and raising funds way before that. Staff and volunteers worked together on the curriculum to determine the elements of each session and decide on which Bible stories to use. Curriculum writers were hired. After an Editors Conference in February, writing for the Fall 2014 began. All of this happened before I was even hired so it was like jumping on a moving train. Fall 2014 was already in the editing stage, rough drafts of its illustrations were arriving in my inbox, and music for the Early Childhood CD and the Year 1 Shine Songbook and CD (for primary through junior youth) were ready to send to the two music coordinators who had been hired. #4 – It takes a lot more than writers and editors to produce a great curriculum. This dedicated group also includes the project director, proofreaders, illustrators, designers, music coordinators, musicians, website designers, marketing departments, and assorted staff persons who do things like get the ISBN numbers and find the best printers. Even congregations and individuals have provided feedback, donated money, and provided teacher tips that we are using in the Shine teacher’s guides. (If you like to learn more about how you can also contribute a tip, please email me.) This curriculum is such a wonderful example of how well two separate companies—MennoMedia and Brethren Press—and three denominations—Mennonite Church USA, Mennonite Church Canada, and Church of the Brethren can work together when they have a shared vision. Shine at the Phoenix Mennonite Church USA Convention summer of 2013. #3 – Technology is vital to the process. Skype and videoconferencing are essential for planning meetings. Special sites handle the movement of extra large files. The internet enables people to work from lots of locations. I am so thankful for technology. At the same time, I am also glad I have met some people in person. I visited the Church of the Brethren offices in Elgin, Illinois, and had the opportunity to get to know the Gather ‘Round staff. This week, I met my coworker, Chrissie Walls, in person for the first time. She traveled from her home in Rochester, New York, to Elkhart, Indiana, for Shine staff meetings. #2 – A curriculum goes through many, many steps before it is ready to be sent to printer. The best image to explain this process is a weaving loom. I hold the long strands (the warp). There’s a strand for each teacher’s guide, student piece, and resource/poster pack. There’s a strand for Shine On: A Story Bible, the songbook, and each CD. There are strands for each type of image. There are even strands for web pages on the public website, www.ShineCurriculum.com and on the website for writers, editors and staff. 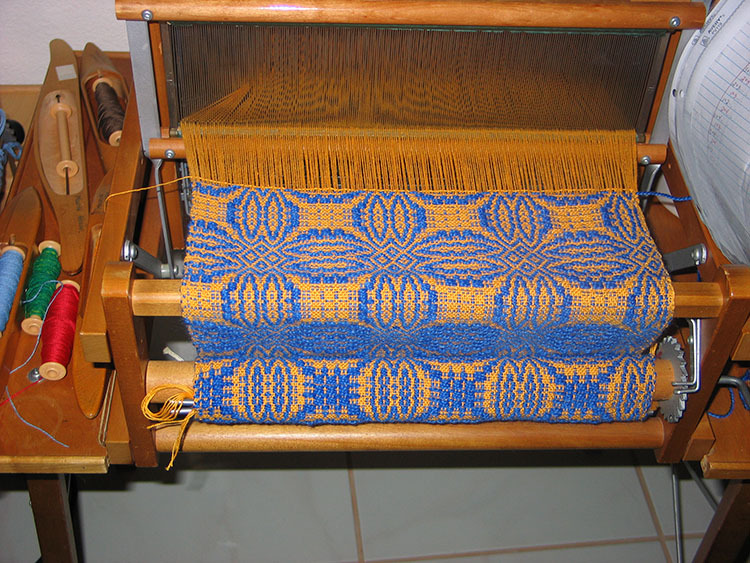 As I hold the warp, it is my job to coordinate the order of the transverse strands (the weft) to eventually make the final useful and attractive product. For example, the illustrator cannot draw illustrations until each editor has described them. It’s a complicated process and can threaten to become hopelessly tangled. But Rose Stutzman, the project director, is a terrific guide. #1 – Developing a new curriculum can be very exciting. I have enjoyed looking at the two-dimensional illustrations and designed pieces that came from one-dimensional descriptions. I was fascinated by how combining words with images in Shine On have made the stories come alive in new ways. Most of all, I anticipate that moment when the first quarter has been printed and I can see all together on my desk—the final useful and attractive product.